Trainer Graheme Begg thinks Written By is well on his way to this year’s $500,000 Group 1 Oakleigh Plate (1100m). The three-year old colt by Written Tycoon enjoyed plenty of success in 2018 winning three Group 3 races as well as the Group 1 Blue Diamond Stakes (1200m) at Caulfield, and has since been spelled in preparation for this year’s Autumn Carnival. Written By, above, is one of the early favourites for this year’s Oakleigh Plate. Begg told Sky Racing on Thursday that we should expect to see Written By in next week’s Group 3 W.J. Adams Stakes (1200m) at Caulfield, a track he is a perfect four-from-four on. “The Oakleigh Plate is his main target, that’s our first target race” Begg said. Having already earned close to $2 million, the lightly-raced Written By ($7.00) is among the favourites to win this year’s Oakleigh Plate alongside Zousain ($7.00), Pierata ($7.00) and Nature Strip ($5.00). After enjoying a jumpout last week, Begg thinks his hopeful is also in good nick as he prepares to return to the races. 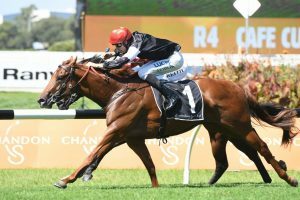 As for the road ahead, the Newmarket Handicap (1200m) on March 9 could be on the cards before a possible return back to Sydney later in the year. “He’s nominated for the Newmarket, we’ll just play it by ear. There’s options to go to Sydney, possibly the Galaxy, we’re just going to weigh it up as we go through our preparation,” Begg said. Full Oakleigh Plate odds can be seen below.